Inspector-General of Schools George Hogben initiated the quarterly School Journal as a free publication containing information on history, geography and civics. This was a cheaper option than publishing several separate textbooks. Until 1939, when a School Publications Branch was formed, the School Journal was the Department of Education’s sole publication for children. Learning Media published the School Journal for the Ministry of Education from 1993 until 2013, when it moved to a private publisher, Lift Education. Believed to be the longest-running serial publication for children in the world, the School Journal continues to provide seven- to 13-year-olds with reading material that is relevant to their lives. Around 750,000 copies are published annually in four parts. 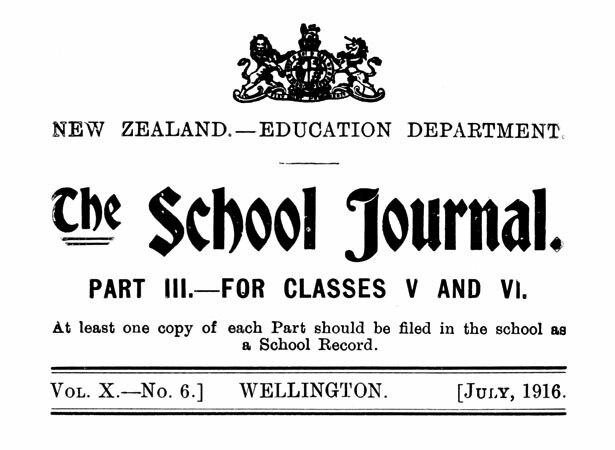 Many of New Zealand’s foremost authors and illustrators have had their work published in the School Journal, including Rita Angus, James K. Baxter, Alistair Campbell, Russell Clark, Jack Lasenby and E. Mervyn Taylor. We have 16 biographies, 5 articles, related to First School Journal published.